While in Jamaica don’t miss the famous Dunn’s River Falls. These iconic falls are one of the top sights in the entire country. Here you can climb the falls, go to the beach, or just relax in one of the many natural pools in the falls. 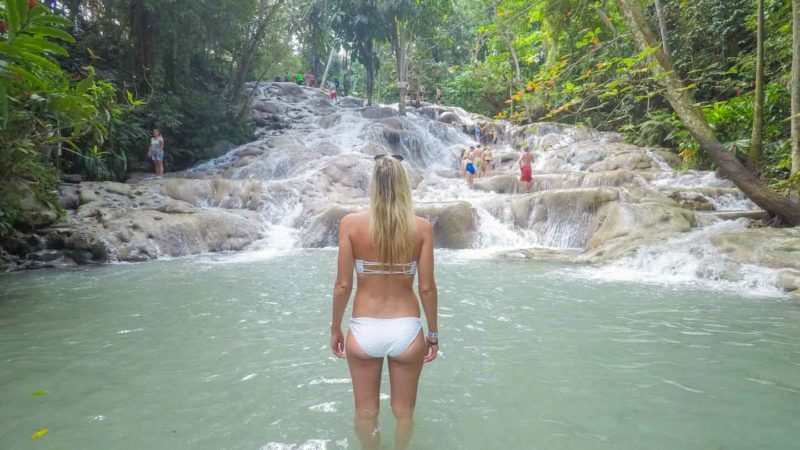 There are several waterfalls in Jamaica but Dunn’s Falls is the best. Here is our guide to visiting Dunn’s River Falls. Dunn’s River Falls is different than most waterfalls in the fact that you can actually climb the waterfalls. The falls are 180 feet high and 600 feet long that lead out the Caribbean Sea. This type of waterfall is called a travertine waterfall and there are few in the world and the only one in the Caribbean that empties into the sea. Dunn’s River Falls is a living natural wonder. The falls are continuously growing and reshaping. calcium carbonate from the river and travertine rock are deposited as the water flows over the falls. The result is hundreds of small dome-shaped cataracts or rock like obstacles the waterfall flows around and over. 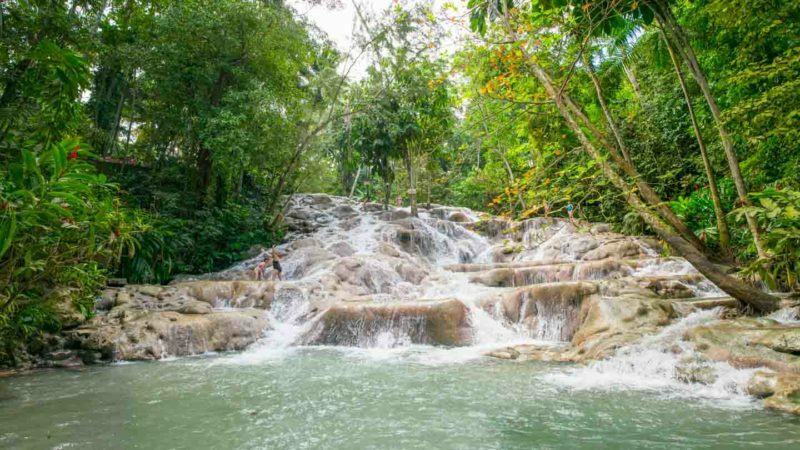 Where is Dunn’s River Falls Jamaica? Dunn’s River Falls is located in Ocho Rios and was just less than a 10-minute ride from our hotel the Moon Palace Jamaica Grande. If you aren’t staying in Ocho Rios a trip to the falls is worth it, here is the distance to other popular Jamaica destinations. If you are on a cruise ship coming to Ocho Rios you’ll have more than enough time to climb Dunn’s River Falls and explore the city. Those whose cruise ships dock in Montego Bay, Port Antonio, or Falmouth will also have enough time to visit the falls but just a little longer commute. 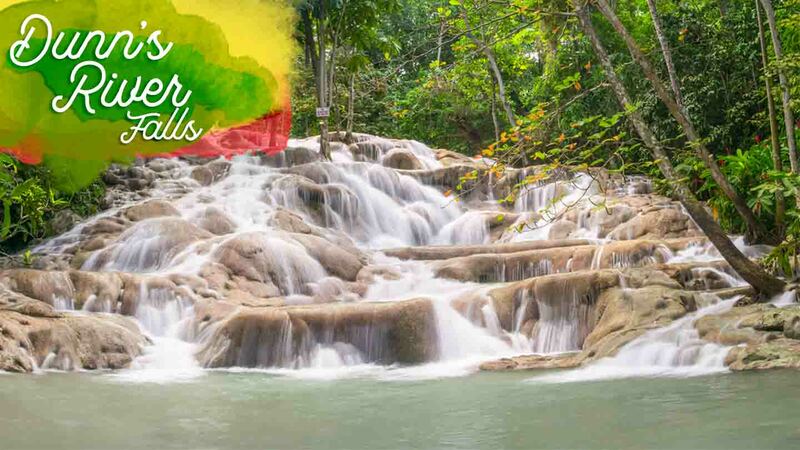 There are tons of Jamaica day trips heading to Dunn’s River Falls, we suggest booking them on your own for the best prices. Most of the hotels in Jamaica have a tour desk that can sell you a tour here or provide you with a driver to Ocho Rios. However, this would be the expensive way of exploring the falls. We suggest booking a tour on your own, here are a few tours you can book online with Viator. If you’re on your Jamaica honeymoon this is a great spot for some couple photos! It is required to wear water shoes when climbing the falls. Most tours don’t include water shoe rentals in the tour price. Water shoes are available to rent for $10 USD. For that same price, you can buy a cheap pair on Amazon for only $2. I personally would rather have my own pair and if it’s cheaper it’s a no-brainer. Water shoes are good to have if you plan on visiting the Pelican Bar as there can be sea urchins. Q: How tall are Dunn’s River Falls? Q: Can you climb Dunn’s River Falls? A: Yes, you have enough time to visit Dunn’s River Falls while on a cruise, the ports are very close to the falls. They are open every day and hours vary depending on the season and if there are cruise ships in port that day. We suggest going right away in the morning or later in the afternoon to avoid the crowds. You can pay with USD, local Jamaican dollar, or credit card. Bring a little extra cash as there is a souvenir market and snacks available. If you are staying at a hotel in Ocho Rios check the cruise port schedules to see how many ships will be docked in Jamaica. Typically Saturdays & Sundays are the days with the least amount of cruise ships but more local tourists as it is the weekend. Avoid Wednesdays as this is the busiest cruise ship day. Have you visited Dunn’s River Falls? Is there a way for people in the group that aren’t capable of climbing to get to the top and wait on the climber? No the only way to access the top of Dunn’s River Falls is to climb it. I will be staying at a hotel only minutes away and don’t want to book a tour, so if I just take a taxi to the falls, how do I get a guide? Is one included in the $20USD admission price? Yes you can just walk over and purchase a ticket there. 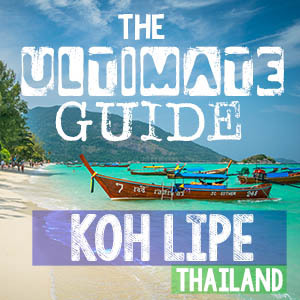 You will go in groups there no need to purchase a guide it’s included in your ticket. You then can stay as long as you want at Dunn’s River Falls. Have a blast! You can only climb up Dunn’s River Falls and only with a guide.